Bailey Donovan, who led Hampden Academy to two Class A North championships, is taking her skillset to Husson University in Bangor next fall. The 6-foot, 3 1/4-inch center averaged 21 points, 17 rebounds and four blocked shots this season and was chosen the Class A North tourney’s Most Valuable Player for the second straight year after posting 49 points, 45 rebounds and 15 blocked shots in Hampden Academy’s wins over Erskine Academy of South China, Lawrence of Fairfield and previously undefeated Skowhegan. She capped her outstanding high school career with 18 points and 13 rebounds in the 54-42 loss to Greely High of Cumberland Center in the state championship game. She was a career 1,000-point scorer and she also grabbed over 700 rebounds. She averaged a double-double for her career and shot 80 percent from the foul line. She will get the opportunity to play with former Hampden Academy teammate Braylee Wildman along with Sydney Allen, a guard who was one of her AAU teammates. “It’ll be really cool to play with them again,” said Donovan who intends to major in business. Donovan shot 78 percent from the foul line and 55 percent from the floor this season. She was also a valuable shot blocker who altered shots with size and wingspan. Walker said she is super excited to land Donovan because the Eagles will have five players who are at least six feet tall for the first time in her 28-year coaching career. The other six-footers are 6-3 freshman Andrea Crosby of Brooks and Mount View High School in Thorndike, 6-foot sophomore Megan Peach of Garland and Dexter High, 6-foot junior Sami Ireland of Howland and incoming freshman Erianna Lawrence of Seminole High School in Florida. Donovan said she intends to focus on her post work along with her overall conditioning strength training. Donovan was among 10 semifinalists in the state for Miss Maine Basketball this year. 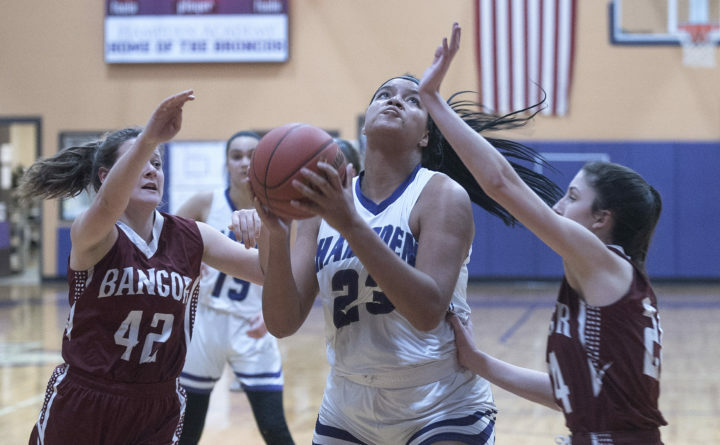 She was named to the Kennebec Valley Athletic Conference all-star first team and was acknowledged as one of the top five defensive players in the league.